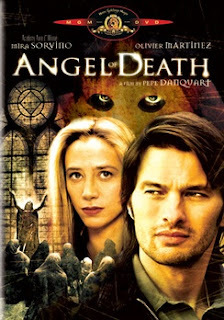 Semana Santa AKA Angel Of Death is a very weak movie. Mira Sorvino plays a detective who is trying to find a killer who shoots arrows in people. "Why do I have to move this flashlight? What movie are we making again?" Mira has an Italian accent which falters from time to time. Couldn't she just speak English? All the other characters have a forced Mexican\English accent which is distracting. The dialogue is very bad and the delivery of it is wooden. The cinematography looks nice, but that's not enough to save this tripe. THIS NEXT PART OF THIS REVIEW DOES CONTAIN SPOILERS!!!! During the climax it looks like the villain is going to get away, but then he comes back down stairs to get shot and do a cool stunt down the railing. That just shows this script has no originality whatsoever. AVOID!